New York, New York is a hellava town. Just ask Bernstein, Comden and Green, who fashioned a zippy tribute to 24 hours in the Big Apple, based on a ballet by Jerome Robbins. 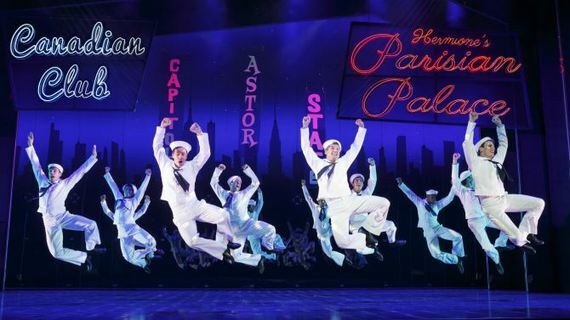 The Broadway revival of the 1944 musical On the Town, now at the Lyric, is an energetic, entertaining romp. Three sailors, on leave for a day, are in hot pursuit of a good time. The love-struck Gabey (Tony Yazbeck) hunts for Miss Turnstiles (Megan Fairchild.) Tourist Chip (Jay Armstrong Johnson) is sexually shanghaied by brassy cabbie Hildy (Alysha Umphress), while Ozzie (Clyde Alves) and anthropologist Claire (Elizabeth Stanley) share a mutual lust. Throw in the versatile, always-comic Jackie Hoffman in a variety of roles, and John Rando's direction hits full tilt. The chemistry among the principals clicks, as does Leonard Bernstein's lovely score, with great songs like "Carried Away," "Lonely Town" and "I Can Cook Too." There is an upbeat, can-do spirit to the musical, thanks to the sassy book and lyrics by Betty Comden and Adolph Green, who infused the show with a youthful exuberance. Choreographer Joshua Bergasse, clearly inspired by Robbins, keeps the energy at high voltage; the three sailors seem to leap and kick with every move, while Yazbeck's pas de deux with Fairchild is beautifully rendered. Indeed, the production values, Jess Goldstein's eye-catching costumes and Jason Lyons' lighting do the musical proud. But the sets, which look cheap and slap-dash, are off-kilter. It's like looking for New York by way of Walmart. Still, the balletic storytelling, bluesy ballads and jazzy numbers render this peppy war-time number a big dose of zesty fun.